Sony is marketing the remake of the Stephen King horror movie Carrie with with “Telekinetic Coffee Shop Surprise”, a prank video set in a New York cafe. Viral marketing firm ThinkModo shot the film over two days in ‘sNice cafe on 8th Ave, New York, with actors posing as customers. As people wandered in off the street for their coffee, stuntman Travis Gravis spilled coffee on a laptop belonging to actress Andrea Morales. With the help of a fake wall and a pulley system Morales proceeded to move Gravis up the wall, scatter the tables and pull books off shelves with what appeared to be mind control. The revamped “Carrie,” which stars Chloë Moretz in the title role, hits theaters Oct. 18. 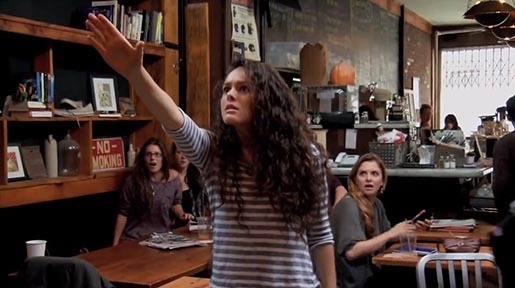 The Telekinetic Coffee Shop video connects viewers with the #FlexlikeCarrie meme, online at flexlikecarrie.com, Facebook, Twitter, Instagram and Vines. The campaign was developed at ThinkModo by James Percelay and Michael Krivicka.